It's the start of a new month, a birthday for me and a new No Croutons Required challenge. For this month's edition of NCR, I would like you to create a soup or salad suitable for vegetarians which features the allium family. You may choose one or feature several. Choose from onions, shallots, leeks, spring onions, garlic or chives. 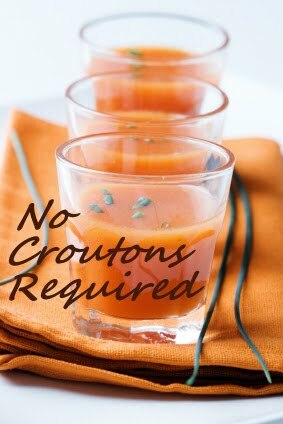 You can find the rules here, but basically just blog your soup or salad, mention that you are submitting it to No Croutons Required and link here. Email me (nocroutonsrequired@googlemail.com) a link to your post, along with your name and location before the 20th April 2010. The round-up will be posted on the 21st April 2010, along with a voting poll and the winner will be announced and sent their winning badge on the 30th April 2010. Congratulations to Jenny over at Southern Fried Curry who won the March edition of No Croutons Required with her Salad made with Fresh Chickpeas. They are just so gorgeous and so very green. I'd love to try these fresh chickpeas. Happy Birthday! And wow... those chickpeas look so pretty and fresh! My husband's been asking me for French Onion Soup for ages. . .perfect time to make it! Happy Birthday Sweetie. Great theme! Happy birthday. I hope your day is really special. I seem to be missing the NCR challenges lately despite my best of intentions. I don't think I've ever had fresh chick peas before! Given how much I adore chick peas, I'm now on a mission to try some! Happy Birthday to you!! Hip hip hoeray!! This saladof fresh chickpeas looks just so good,...mmmmmmm! Those chickpeas look beautiful. They'd do very nicely for St. Patty's Day! Love the recipes, keep up the great work!